Brawling Green: How was there no ejection on this TD? Bowling Green Falcons defensive back BooBoo Gates returns a kickoff 94 yards for a touchdown during the third quarter. How about some punch with your pizza? 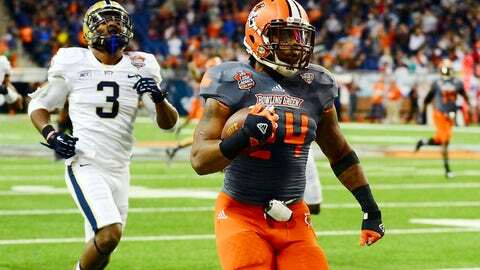 While Bowling Green’s BooBoo Gates returned the second-half kickoff 94 yards for a game-tying touchdown Thursday at the Little Caesars Pizza Bowl, special teams teammate D.J. Lynch threw a flurry of punches at Pittsburgh tight end Manasseh Garner — and somehow did not get ejected or negate the TD. Officials ruled that the touchdown stood, with offsetting penalties after the play. Ultimately, Pittsburgh won 30-27. Check out the incident between Lynch and Garner in GIF form below, courtesy of @SBNationGIF.